Hotline Miami is wonderful. Dennaton’s 2012 indie hit was a top-down murder spree, chucking you into a house of bad guys with little to no context and not letting you out until you’d battered every ne’er do well in there to paste. It was a bloodbath, sure, but there was something almost balletic about racking up an impressive combo. The 2015 sequel didn’t quite live up to the original, but one developer has offered the series a final moment in the spotlight, reimagining the original as a PS1-era title. Horror dev Puppet Combo has built a low-poly 3D version of the game’s first level (via Kotaku), letting you relive the carnage from a whole new perspective. 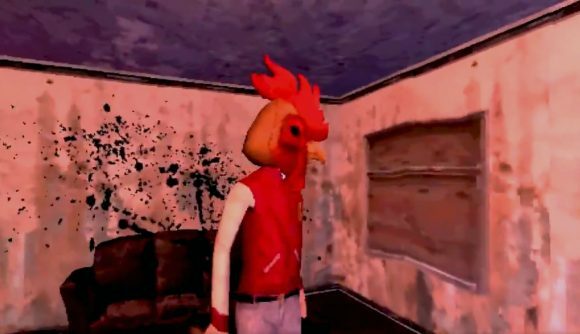 The level puts you in control of Hotline Miami’s main character, Jacket, kitted out with his iconic chicken mask and a trusty lead pipe. Dropped into a bad-guy hideout, it doesn’t take Jacket long to begin his killing-spree, as he sprints up the stairs and dispatches the first enemy he sees. You can check out the rest of the video in the tweet embedded further down this article. The fan-made remake captures a lot of the joy of the original game – the excellent soundtrack is there, for one thing, as is the general sense of bloodlust. But removing the top-down aspect of the game changes things up a little – avoiding your enemies now involves trying to catch a glimpse of them through an open door, rather than keeping tabs on them through the ceiling. It makes for an interestingly stealthy take on the game. You can see what I mean for yourself in the video above. Sadly, it’s unlikely the remake will ever come to much, but if you like the look of it you might like to check out the rest of Puppet Combo’s work. The developer makes retro horror games, which you can download via their Patreon. There are some brilliant titles on offer, including Texas Butcher and Meat Cleaver Mutilator, but my personal favourite is Spiders, a 90s-style FPS where you have to defend your home from hordes of giant spiders.